An average workplace is reached by an ambulance in 8 minutes after a call is placed in them. A cardiac arrest or a blocked air passage could kill a person in less time than that. These 8 minutes till medical help arrives on the scene could be the difference between life and death in many life-threatening situations. The chances of survival of a person who suffers from cardiac arrest go down with every passing minute that he is left unattended and without proper resuscitation. A trained first aider could be the difference between life and death. A blocked air passage can be easily cleared by a person trained to do so and a life could be saved. A foreign object lodged in the eye can be washed off with proper care and technique and the gift of eyesight preserved. The fact of the matter is that accidents do happen. It is better to acknowledge this unpleasant fact and be prepared for it since accidents will not disappear by wishing them away. Being prepared for them and knowing how to respond is what first aid training is about. But it goes beyond that too. Why is first aid training so important? The knowledge of the correct first aid procedures and techniques helps provides assistance to victims of injuries and illness till professional medical assistance arrives. A trained first aider can provide help in case of common injuries as well as during various emergency situations. If someone has ingested a hazardous substance, or if a natural disaster occurs, or if a colleague suffers a cardiac arrest, a qualified and trained person becomes more than just a bystander. 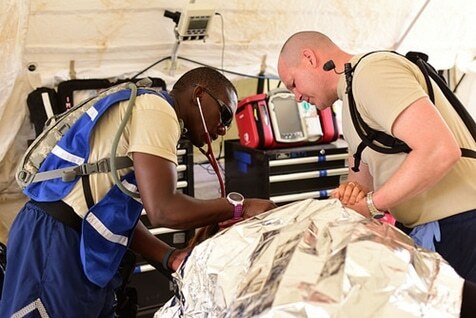 Instead, the trained first aider can not only provide critical assistance to the victims that may save lives, as also to professional medical practitioners as and where needed. A trained first aider will use the correct methods of administering medical assistance. In an emergency, such as fire, not only it is important to respond immediately, it is equally important to respond correctly and perform the correct procedures. Critical human functions such as the brain can expire within minutes due to lack of oxygen. A person with proper knowledge and instruction is first aid will be required to respond in such situations. A good first aid training goes beyond techniques to be used in case of emergency. It also prepares the first aider to identify sources of risk and devise methods to minimize the danger from these sources. The risk assessment a workplace whether it is a food preparation workplace or a factory, a warehouse, a clinic, a laboratory can vary quite substantially. Each individual workplace has its own unique sources of risk which need to be identified and dealt with by a trained eye. Properly trained first aiders will ensure that your organisation is compliant with WHS requirements. Programs such as those by Alsco ensure that there is complete compliance. All certifications are up-to-date and current, with trigger alerts for when certifications need to be renewed. This is done by means of an on-line, encrypted, secure system which maintains the database of certifications. The system is used for recording and reporting incidents. Each incident at the workplace along with the treatment given can be recorded in this system. This data can be used for reporting to WHS as well as for internal analysis. Analysing real-time data is the best way to create and improve a safety plan that is unique to the conditions of each distinctive workplace. WHS requires that there always be a first aider at every workplace accessible at all times there are workers at the workplace. While everyone can benefit from first aid training, it may be a more necessary requirement for certain people. People who educate and watch over children should, ideally, be able to perform first aid. Day care centre personnel and nannies should be able to assist children immediately in case of emergencies. Lifeguards should also be certified in first aid procedures. Various businesses require their employees to be trained in first aid. The type and extent of the training depend on the job specifics. However, anyone who works in high-risk environments should have basic first aid knowledge. As such, many employees in factories, machine shops and industrial plants are provided with lessons in first aid procedures. Accidents will always happen. Because of this, properly trained individuals and the right first aid equipment help ensure better safety for everyone. Without the proper first aid training, a simple injury could turn into something much more severe. Many fatalities resulting from accidents and emergency situations result from lack of immediate medical treatment. Training about proper first aid procedures doesn’t just facilitate recovery. It helps save lives. So call a registered training organization and get your employees trained today. Save lives and ensure you are compliant too! Alsco Inc. was the first company to introduce linen and uniform rental services to the world in 1889. Today it has more than 16,000 employees and over 150 branches worldwide. Alsco Australia was established in 1963. Its service includes rental, leasing and laundry services for linens and uniforms; washroom and hygiene products; and first-aid kits and training. Safety at workplaces is very important and that’s Alsco’s primary goal. We don’t just offer services, we offer safety! Call us now for more information 1300 651 706.